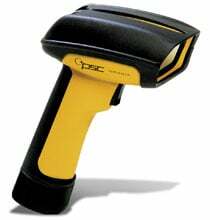 Datalogic PowerScan - Industrial Handheld Barcode scanner (Standard Range, Keyboard wedge Interface, 8-0424-03 12 ft. PS/2 Cable). Discontinued and replaced by Scanner (Part# PD8330) and Cable (Part# CAB-436). The Datalogic PSSR-1000-01 is also known as Data Logic	PSC-PSSR100001	or PSSR100001	.